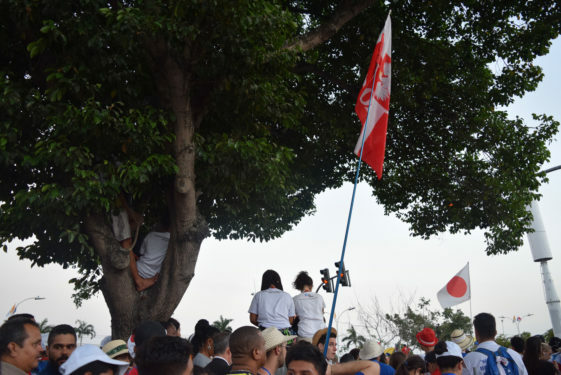 PANAMA CITY — On the day before pilgrims had the opportunity to personally experience Jesus’ journey to Calvary with Pope Francis during the World Youth Day (WYD) Way of the Cross event, the diocese’s group had to carry their own personal cross during a traumatic experience at the entrance way into the Papal Welcoming Ceremony at Santa Maria la Antigua Field, Jan. 24. “It was scary at first because you started seeing everyone fainting and it kind of basically made you feel uncomfortable and lose hope,” said Catherine Salazar, a pilgrim from St. Dominic, Bensonhurst. 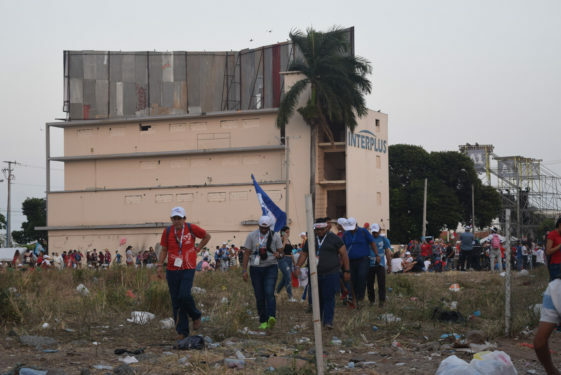 Salazar was one of the nearly 200 Brooklyn pilgrims who made their way to the field gates nearly three hours before the afternoon welcoming ceremony started in order to secure their spots in the field to see Pope Francis. To help pass time in the scorching heat, the Bensonhurst Youth Cluster group started reciting the rosary out loud. They said after they finished the rosary, the line started to move. 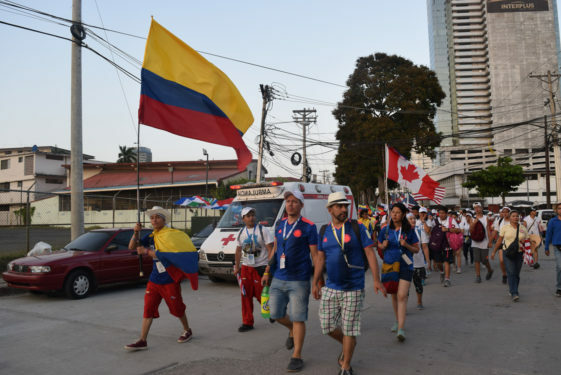 Except instead of a seamless transition into the area along Panama City’s bustling park area nestled in between two of the city’s main highways, pilgrims had an unexpected experience. “It was really crazy,” she added. “Everyone was pushing and shoving and there was a point where we were all suffocating. 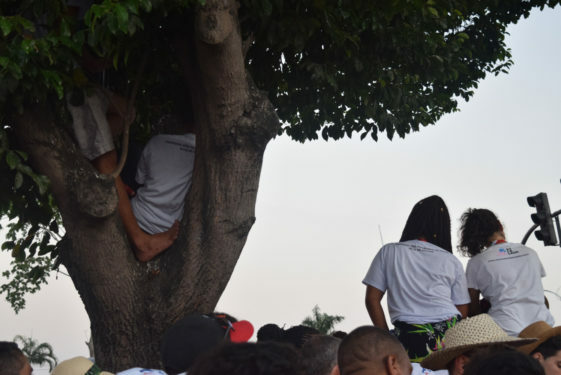 Getting literally to the gate you either push yourself and fall or you push yourself and run.” Nonetheless she felt a sense of security because two of her group leaders, Marta and Deacon Jaime Cobham, never kept their eyes off the group. 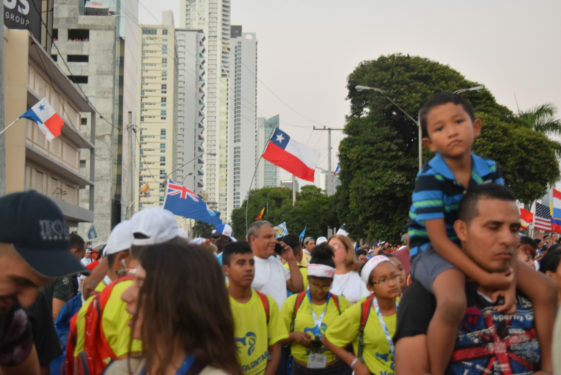 In terms of overall attendance, Panamanian media stated that the welcoming ceremony attracted nearly 150,000 people, which included volunteers, pilgrims, priests and bishops from more than 156 countries. 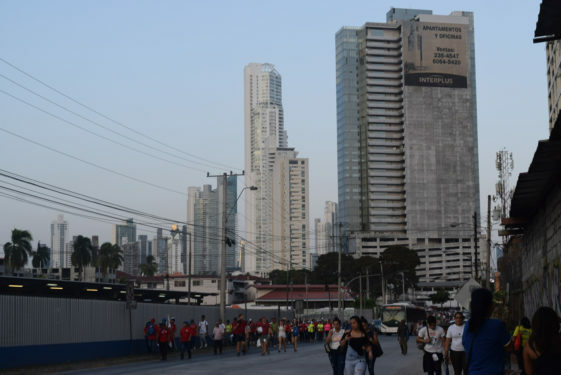 Local media stated that the Panamanian task force provided security from more than 4,000 units of the San Miguel Arcangel Interagency Joint Task Force. 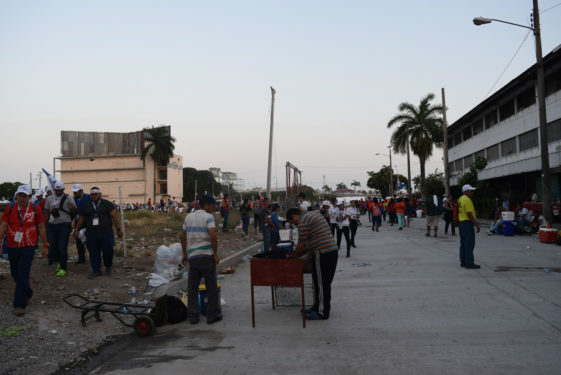 Most entrances close to the stage where Pope Francis appeared and where the Brooklyn group was designated, were divided into four lanes marked with metal detectors and metal crowd separators. Out of the 783 medical care cases that were reported and treated that day, none were from the Diocese of Brooklyn contingent. 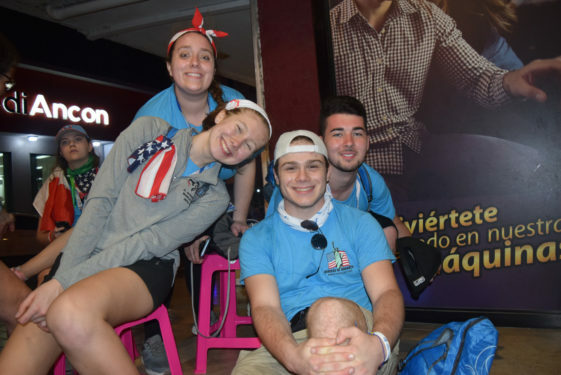 “You do always have trying, challenging moments where you’re in tight crowds … the fact that we were in there for three hours to get one block, we were constantly squeezed,” said youth minister Kenny Wodzanowski from the Bensonhurst Youth Cluster. 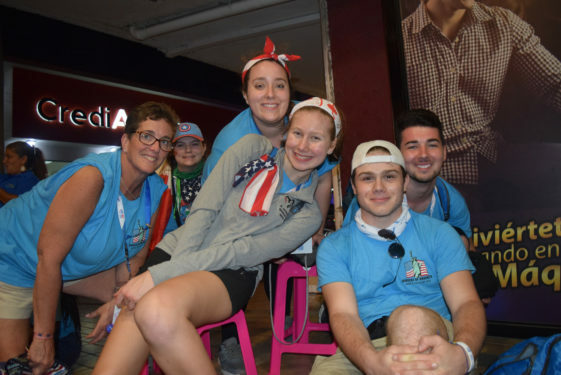 The cause for concern reached WYD USA representatives from the United States Conference of Catholic Bishops. 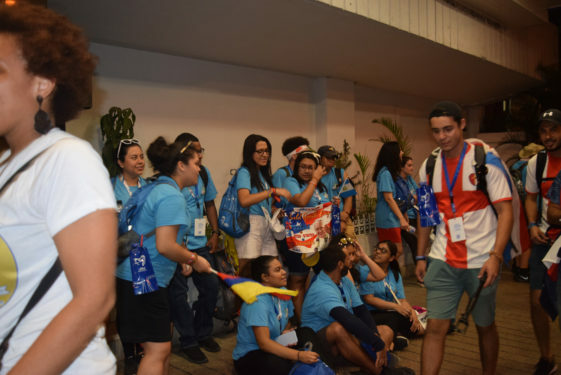 The Coordinator and Assistant Director of Youth and Young Adult Ministries, Paul Jarzembowski, told The Tablet that the health and safety of World Youth Day pilgrims are key factors that should be paramount in any event planning. Despite the heat, humidity and hours spent in line to enter the Welcoming Ceremony, many groups of Brooklyn pilgrims were still resilient and determined to see Pope Francis. 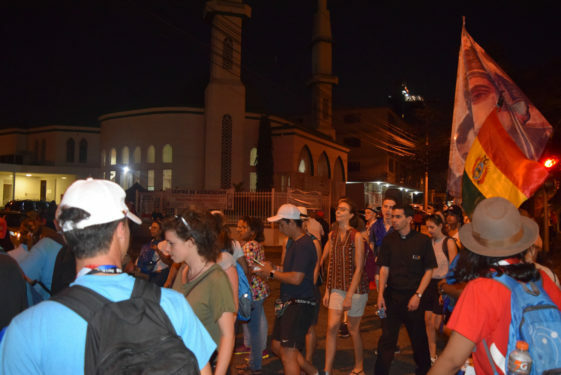 In times of excruciating circumstances, they turned to the one thing that they hoped to strengthen during this pilgrimage: their faith. 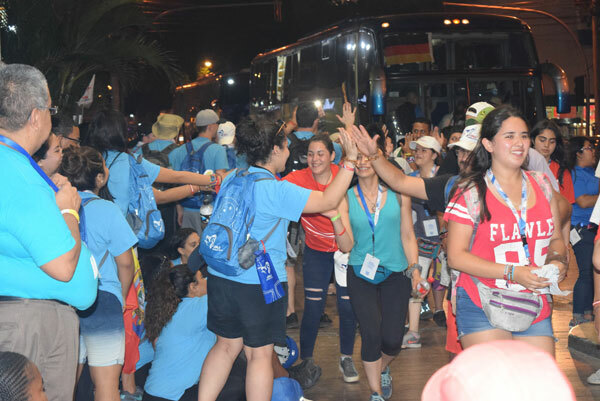 Prayer was also the saving grace for pilgrims from a combined group of Our Lady of Lourdes, Queens Village; St. Gerard Majella, Hollis; and Presentation of the Blessed Virgin Mary, Jamaica. At one point, the group got separated from each other. 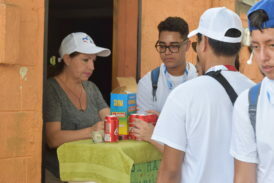 Eventually they found their way back to each other thanks to their group leaders, Angelica Taveras and Gilbert Rodriguez. In order to stay in close proximity, some of that group’s pilgrims said they locked arms. Getting through the gate was a shocking moment for pilgrim Yamitzla Reid. For the Bensonhurst Youth Cluster group, the stressful moments at the welcoming ceremony transformed into a reflective, learning moment. Hours before sunset, as the Holy Father entered the field named after the patroness of Panama, Our Lady of Antigua, the crowds cheered. The chaos had come to an end. 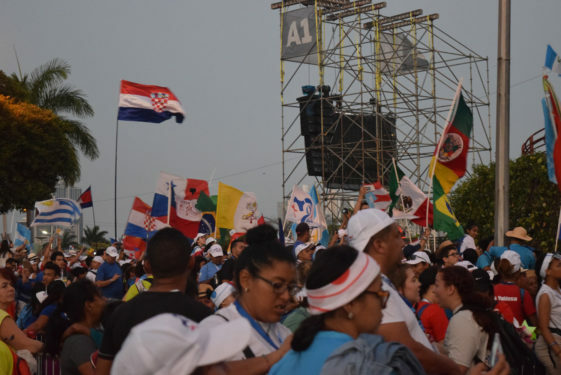 The themed WYD chants in Spanish were sung in unison. Different flags from around the world were flying high in the skies. 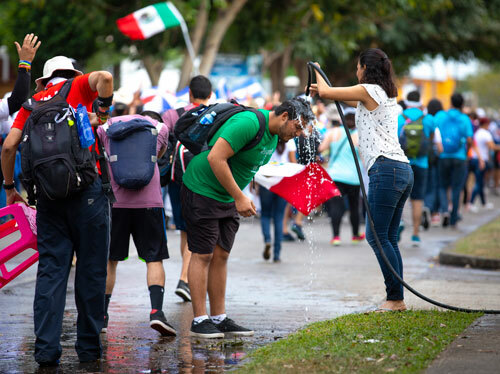 The young representatives from the universal Church were once again in solidarity with one another – a consistent theme of unity and joy that permeated throughout the week. 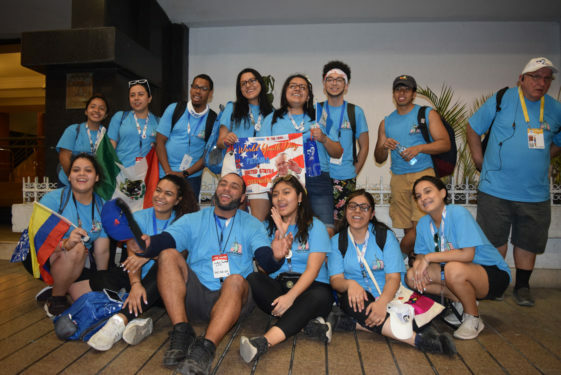 For group leader Father Carlos Quijano, S.J., while he knew the Panamanian experience was different in comparison to WYD Poland that took place three years before, he saw the silver lining with the Panamanian people themselves. As if the Holy Father’s message wasn’t foreshadowing enough, he addressed the thousands of pilgrims standing before him and told him that the Church was walking with them. 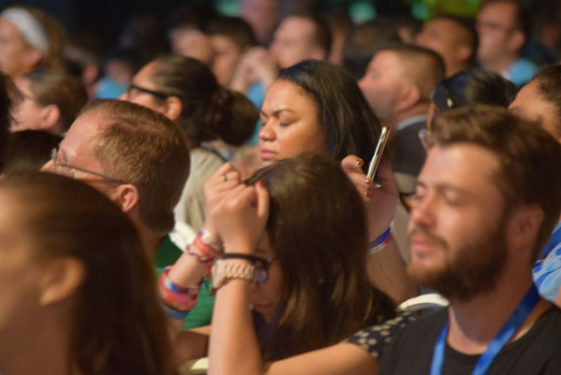 Pope Francis told the young Church to not be afraid, to go forward with the same fresh energy and restlessness that helps bring about happiness and better witnesses to the Gospel. 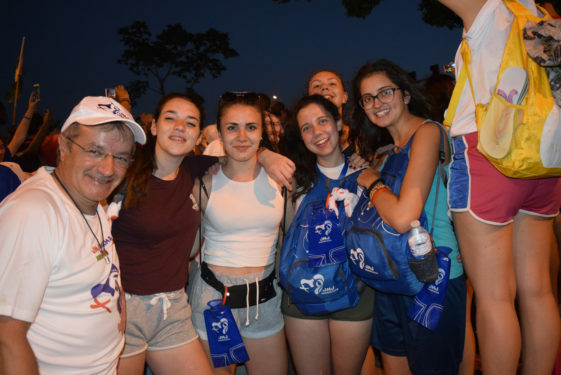 Just hours after the pope spoke to the pilgrims, the Brooklyn pilgrims were doing just that: rejuvenated, tired, but energetic enough to chant the WYD theme and sing praise and worship songs with other international pilgrims. 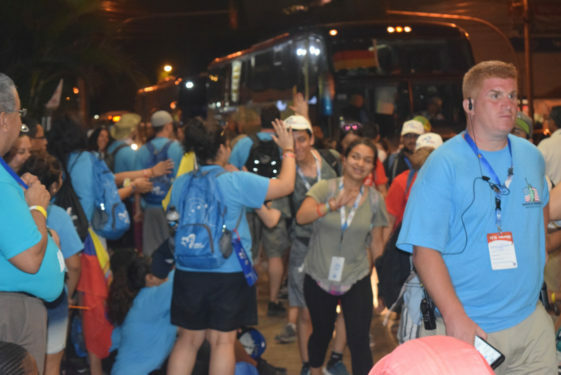 In intervals, the groups left the park under the strict direction and guidance of diocesan pilgrimage director Father Gerard Sauer. 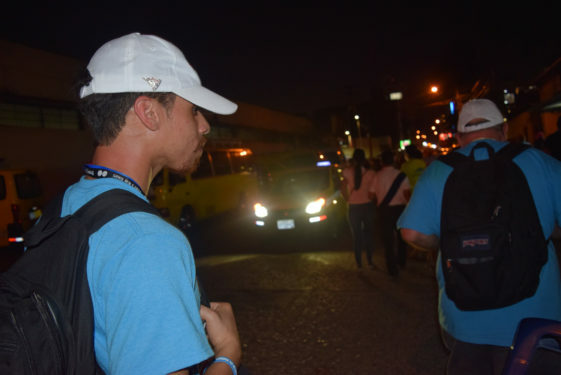 Throughout the route, the diocese’s laymen security team, as well as Fathers Jose Diaz and Sean Suckiel, made sure every pilgrim was accounted for and that no one was left behind. 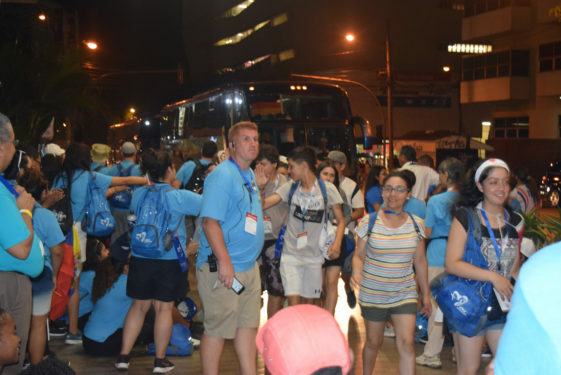 In a sea of shirts that all said Diocese of Brooklyn World Youth Day, the pilgrims lined up on both sides of a hotel entranceway while they waited to board a bus to meet Bishop Nicholas DiMarzio for a dinner at the Panama Canal. A sea of smiles from the diocesan contingent lit up the night after a dim start to their afternoon. Not one group of strangers who passed in front of them did they not cheer for or try and take pictures.